Court Gardens Farm sits in the lea of the South Downs, just to the north of Ditchling. It is home to Howard and Jenny Corney; a traditional mixed farm with an emphasis on sheep. The vineyard occupies three fields in the centre of the farm; we created the first vintage of Court Garden Sparkling Wine in 2007, and have just released some of the fifth vintage. More information on our international award-winning sparkling wines, which you can order online. 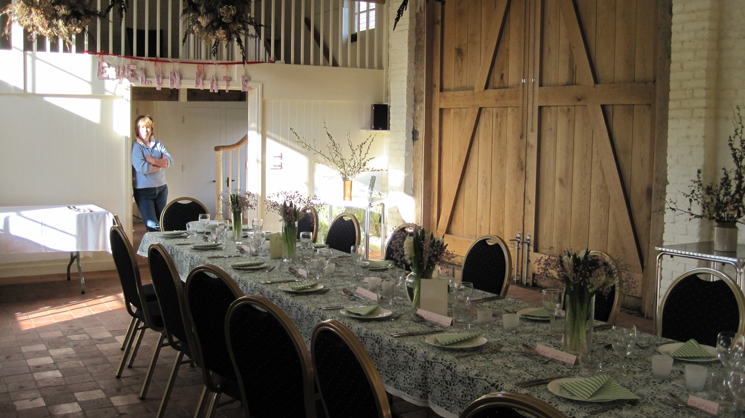 We also have a beautiful early nineteenth century Sussex Barn that is available for hire, and is perfectly suited to wedding receptions, as well as small musical events, recitals etc. For more information on hiring the barn, please see the Sussex Barn section of the site. We also host wine-tasting events in the Barn. You can find more information on Vineyard Tours and Wine Tasting events here. The farm is also home to a variety of wildlife, most notably Kestrels and Barn Owls. Check out the Farm Diary for news of these, as well as lambing and shearing.